While we no longer have to wait for ‘R’ months to enjoy oysters, fall still signals oyster season on the Chesapeake with oodles of oyster festivals in Maryland and Virginia over the next few months. This annunal event, held from 4 to 7 p.m. at the Calvert Marine Museum in Solomons, MD, is a key fundraiser for the skipjack Dee of St. Mary’s. Indulge in the fattest and saltiest oysters on the half shell, heavy hors d’ oeuvres, beer and wine, and live music under the Drum Point Lighthouse on the museum’s waterfront campus. Tickets cost $75, available at calvertmarinemuseum.com. Enjoy the bounty of the Bay and salute the working watermen of the Chesapeake at this 38th annual festival in Virginia. Around town there will be arts and crafts vendors, fresh seafood, live music, workboat races, a petting zoo, and more. No matter how you like your oysters, you’ll find what you’re looking for at the U.S. Oyster Festival October at the St. Mary’s County Fairgrounds in Leonardtown, MD. The main event is the U.S. Oyster Shucking Championship and the National Oyster Cook-Off, but you’ll also find live music, performers, beer, craft vendors, and oysters served every way you could imagine. 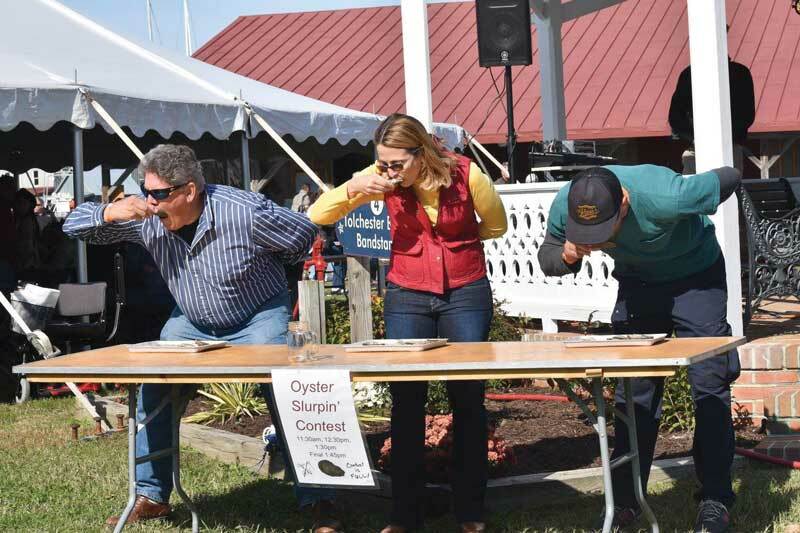 The Chesapeake Bay Maritime Museum's Oysterfest will feature oysters (obviously), along with local fare, craft beer and spirits, live music, scenic river cruises on the Winnie Estelle, cooking presentations, oysters demonstrations, Chesapeake Bay retriever demos, and more. Special to this year’s festival will be the re-launch of the 1889 bugeye Edna E. Lockwood, whose nine-log hull has been restored by CBMM shipwrights and apprentices over the past two years. Non-member tickets are $18 for adults, $15 seniors, and $6 children ages 6-17 (5 and under free). Member tickets are $5 per person. Come by land or by sea to this walking pay-as-you-go festival in Urbanna, VA, featuring wine and oyster pairings, craft beer tastings, oyster shucking contests, an antique car show, educational exhibits, and vendors serving these bivalve delicacies a variety of ways. At the Urbanna Town Marina, visitors can board traditional vessels, including the Lynx and the Claud W. Somers skipjack, learn about Native American and colonial heritage, and the traditions of the watermen of the Chesapeake Bay. 4 to 9 p.m. at the Havre de Grace Maritime Museum - a community event in support of the museum! Tickets are $55 per person and include all you can eat and drink: oysters on the half shell, steamed oysters, fried oysters, oyster stew, Maryland crab soup, Old Bay wings, BBQ ribs, pit beef, and more! Did we miss your favorite oyster festival? Email [email protected] for inclusion!